Disclaimer: if you try this and get your gear stolen, I accept no blame: I readily admit that this does not provide robust security, just a deterrent. Staying in a campsite, it can be difficult to secure items such as bicycles, cookers, solar panels etc against theft. Even the tent itself could be stolen in more dubious places! If you have travelled by car or have a caravan or motorhome, that can be used as a reasonably safe place to lock up gear, or lock it to; but if you are travelling by public transport or bicycle etc, it is not so easy. Ideally one should lock bicycles etc to something that can't move or easily be cut, such as a tree or metal railing. But in a campsite, there may be no such object close to where one has to pitch tent, and it is incovenient and insecure to lock up bicycles some distance away, perhaps out of sight, where there is something to lock them to. One can buy a screw anchor to tether pet dogs to. This is a longish (say 15" or 40 cm) metal screw that you screw into the ground, with an eye or loop on the top to tie the dog's lead to. Similar devices exist for pinning down awnings, and larger ones are sometimes used in construction. A device like this is extremely difficult to pull out of the ground. But obviously, anyone else can unscrew it again, so it doesn't provide much security against theft. However, if such a screw anchor can be locked against rotation, it is much harder to get out of the ground. This is the crux of this idea. You could simply screw two such anchors into the ground, next to each other, and then pass a sturdy bicycle lock, or locked chain, through the eyes of both of them. Then neither can be unscrewed from the ground without cutting or breaking something. This provides a secure anchor to which a bicycle or other gear can be locked (perhaps with the same lock). However, while this arrangement should provide a useful level of deterrent, and is lightweight and portable, it can still be dug up with a shovel. If a bicycle is laid down on the ground immediately over the anchor, digging it out should be quite tricky (assuming the thief does not want to damage the bicycle). 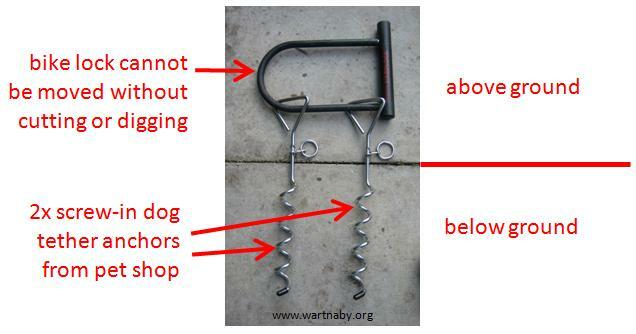 So cycle tourists might like to just pack a couple of screw-in dog tethers (preferably made of light alloy) to secure their machines with their existing bicycle locks. However, it would be more secure to have a flat and sturdy metal plate or grille covering a reasonable area of ground around the anchor, held down by the screws. In fact if the plate has some ribs or spikes protruding groundwards to resist rotation, and something sticking out of it which can be locked to the screw to stop it from being unscrewed, only one screw is then required. This plate or grille would require a thief to excavate a correspondingly larger area of ground to remove the anchor and steal the valuables attached to it, increasing the deterrent effect. This would be difficult to make sturdy and yet light and portable, however, I admit. If you really trusted this arrangement, you could lock a lockable metal box to it and put other valuables in that. But don't forget that it can be defeated with a shovel and a bit of concerted digging effort (or a hacksaw). If you trust it less, it could be augmented with some sort of alarm system -- though you won't be popular on the campsite if false alarms go off in the middle of the night.